This post is a part of a series of articles written by a member of our YTH Youth Advisory Board. If we look back in time, we can quickly realize that humans have been able to create amazing advancements in science, medicine, technology, and healthcare. For example, Jennifer Doudna recently invented CRISPR, a fascinating gene-editing technology . Physicians can now access patients’ medical histories with the click of a button, thanks to Electronic Health Records, facilitating quality care to patients across the country. Surgeons even completed a double-face transplant in April! (Garrel-Jaffrelot 2018). But of course, there is still a long way to go; we still don’t have cures, much less effective treatments for chronic diseases like cancer and Alzheimer’s, and healthcare is more expensive and inaccessible in the United States than ever before. In fact, one in five American adults under 65 have an unmet medical need because of costs, according to health-policy expert Genevieve Kenney There is a desperate need for a sound community health infrastructure, disease prevention, medication adherence, and much, much more. The one thing all these public health issues have in common is that they require holistic approaches to be truly solved. What do I mean by holistic? I came upon this idea during my tenure as the Vice Chair of the Homeless Commission for the City of Berkeley. A pre-medical student myself, I joined the commission hoping to improve the accessibility and quality of healthcare for homeless people on the street, with a focus on HIV and Hepatitis. However, I came across one, major roadblock; I did not know where to start. Although I learned all about these diseases from a biological perspective in my science classes, this knowledge was not nearly enough to make a real-world, tangible impact on the homeless community. I soon came to realize that I needed to learn the sociological factors that force homeless people into a cyclic form of social reproduction – the reason why homeless people, more often than not, remain homeless. I needed to learn the City of Berkeley’s policies, as well as California’s policies, on homelessness and new healthcare establishments. I needed to learn attempts made by other cities to alleviate homeless people’s increased risk to Hepatitis and HIV. But it was more than just a learning process. I needed to acquire skills as well. I practiced my ability to lobby and be persuasive and concise. I gained a sense of professionalism when talking to City Council members and the Mayor. Public speaking became the new norm. Eventually, I was able to work with my fellow Commissioners, City Council members, and the mayor to follow through with a plan to establish Port-A-Potties and sanitation areas at homeless encampment sites. This was a small, but effective, step to reducing their risk to Hepatitis A. Even such a relatively minor feat demanded so much more from me than what I learned in my science classes. I realized that my focus on healthcare required a focus on more than just biology; it required a focus on sociology, writing, public speaking, public health, and public policy. I soon came to realize that healthcare is tangled in all these fields of study. My entire undergraduate experience consisted of a never-ending supply of science courses. These were, without a doubt, important knowledge-gaining ventures that I immensely enjoyed, but not enough to provide me the necessary tools to work directly with patients in the real world. After this experience, I began taking courses outside of the scope of my major. I took multiple courses in sociology, statistics, English literature, comparative literature, and history to accent my study of the sciences. These courses taught me how to communicate, persuade, identify problems in my community, and ultimately, how to solve them using integrated approaches. My newfound realization was further supported, as I continued my undergraduate career. When I attended MedHacks at the Johns Hopkins School of Medicine, I worked on a team to develop a software that generated a curated news feed of clinical trials, condensed research articles, and local health resources, based on a user’s survey. Upon entering the program, I didn’t have any technical knowledge of coding, so there was a very large learning curve I had to face. However, after witnessing all the other amazing ideas that people had developed with computer science, I knew I had to learn more about IT and programming. Many of my fellow participants had developed apps that reduced the harmful effects of food deserts, fixed the language barriers between immigrants and physicians, identified a patient’s vulnerable areas to bed sores, and so much more! This confirmed my belief in the importance of holistic education for students interested in healthcare. Too often, we see pre-medical students taking loads of science courses and shying away from courses outside of their comfort zones. Some even reject them by saying they are not useful. My experiences have proven to me otherwise. I encourage all of my peers, who seek to make an impact on healthcare, just like I do, to step outside of your scope of learning and obtain a truly holistic education. Because healthcare is so much more than just science, it’s a practice. 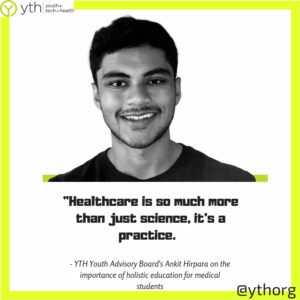 Ankit Hirpara is a Junior at UC Berkeley majoring in Molecular & Cellular Biology. His passion for health care developed after his internship at Wockhardt Hospital, India where he helped physicians set up health camps in impoverished villages and provided lectures in Gujarati on HIV transmission. After this trip, he decided he wanted to impact medicine in as many ways possible, paying special attention to the social determinants of health care. He currently serves on the Homeless Commission of the City of Berkeley, representing District 7, and has developed lasting relationships with many underserved persons on the streets of Berkeley. 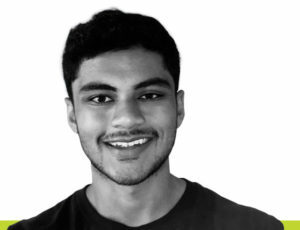 As a pre-med, Ankit intends to impact health care through his biomedical research, app development, grant-writing, policy making, and clinical work.